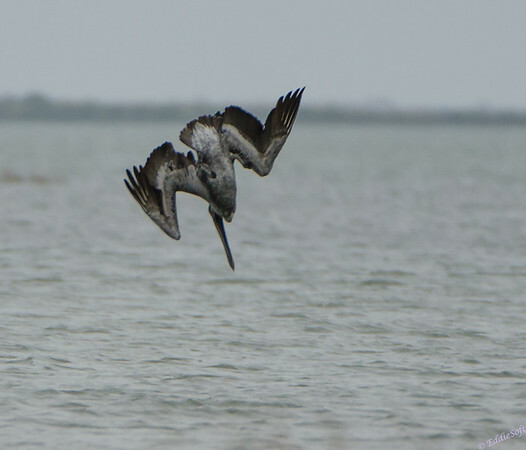 Might as well get the third post out on the Pelican series. This post is also from the draft queue like the last few posts – definitely chipping away at the processed backlog. Pretty soon I will actually have to open the door to my digital darkroom and start processing again or I’ll be short on the upcoming quotas. Always good to have a few held back in case of emergencies, but it is a somewhat demoralizing to have so many laying around just pleading to hit the mainstream ha. 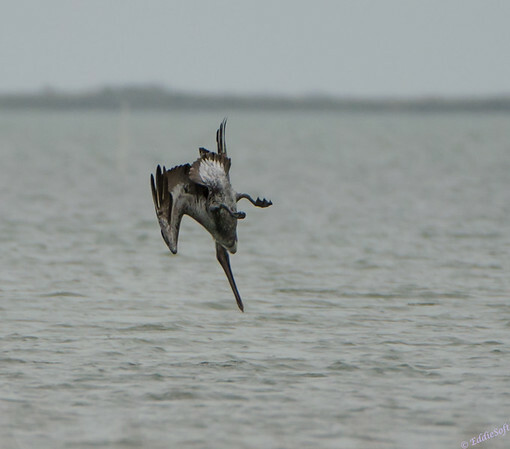 I promised you a different perspective of the bird in the previous Brown Pelican posts and here it is …. Back in November of 2013, Linda and I were checking out the Galveston Island State Park area. Having wound our way to the back park (the right path that takes you past the campground that ends at the water’s edge) we were busy looking for anything worth shooting out on the mudflats – peep country! We kept hearing this loud popping noise like someone smacking the water with their hands. We’d look over and just see a Pelican cruising by. Eventually the cause of the noise was discovered. 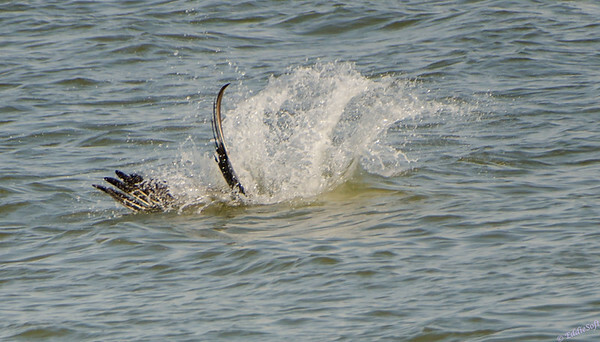 Apparently the Brown Pelican is suicidal! Fortunately for us bird watchers, their necks are incredibly strong hehehe. 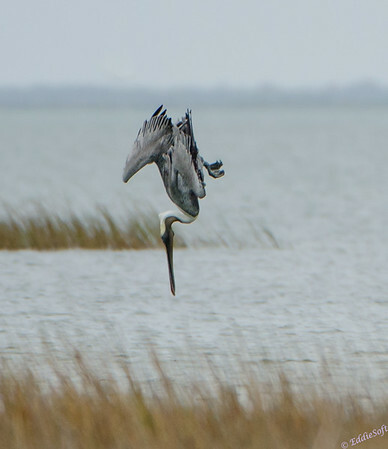 I had absolutely no idea that these large birds can be so acrobatic. Now that we knew what to watch for, we would spot a Pelican coming across the water and simply wait until it made a rapid ascension while banking backwards. Pretty sure our fighter jets were modeled after this aggressive positioning because it looks straight out of Top Gun. “I’m gonna hit the brakes, he’ll fly right by”. “Take me to bed or lose me forever”, oops, wrong quote, ignore that last one. Anyhow, this whole scene is amazing to watch. I can’t say if I ever actually saw one score a fish – well, their pouch never seemed to be filled with anything. We were pretty far from the actual hunting area – had to rely on the reach of the Beast to capture what I could. As a result, not sure what was going on below the waterline. Guessing their target was stunned when that explosion occurs right above them. 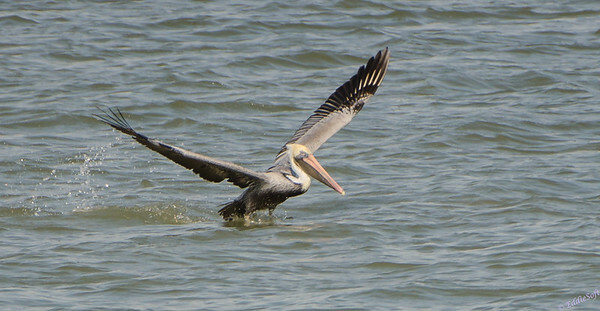 Most of the time, the Pelican would hit the water off angle from vertical. Not the best approach to reduce risk on the neck, but clearly these birds have it figured it out. It may have something to do with providing the best angle to use their pouch for scooping up food. 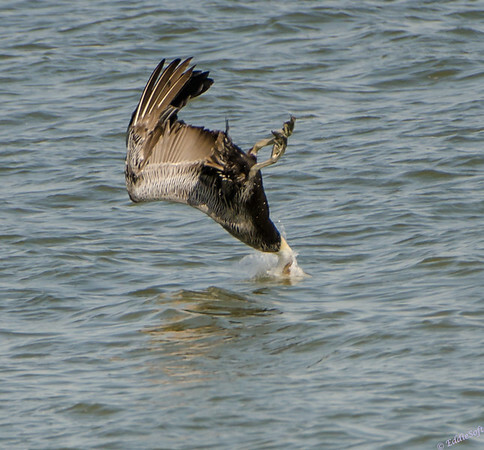 Similar to the Osprey, these birds pull their wings in (assuredly to keep from snapping them off on impact) end up submerging themselves. Pretty cool. There was a lot of bits in the digital garbage can as a result of unsuccessfully trying to capture this whole process. If the timing wasn’t off the exposure would be… then reverse, then both off. Every once in a while I would get it right. Thank god for digital or I’d be broke from processing fees. With the exception of glass quality, the film investment was a huge barrier between professional and amateurs. This day and age it is mainly equipment costs and field experience. Although a bit soft, this next shot is probably my favorite. Full vertical milliseconds from impact and just high enough not to get eclipsed by the water grass. Note, the image a few shots back of the bird’s head in the water past 90 degrees is my other favorite shot from the series. 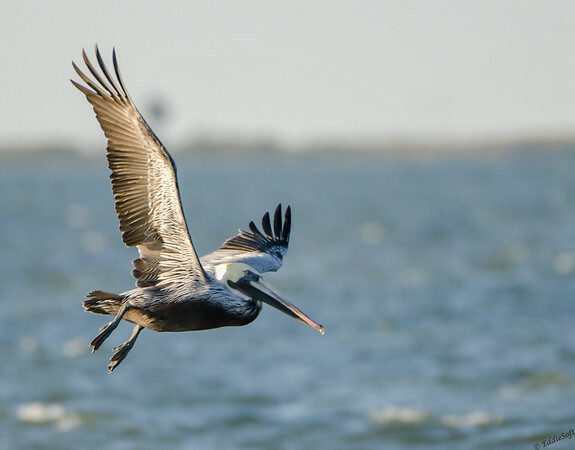 Once the impact is complete, the Pelican will float to the surface and regroup for a few seconds – probably has to figure out which of the 4 visions is the right one. Once the brain fog clears, the wings extend out and takes off for another bombing run. 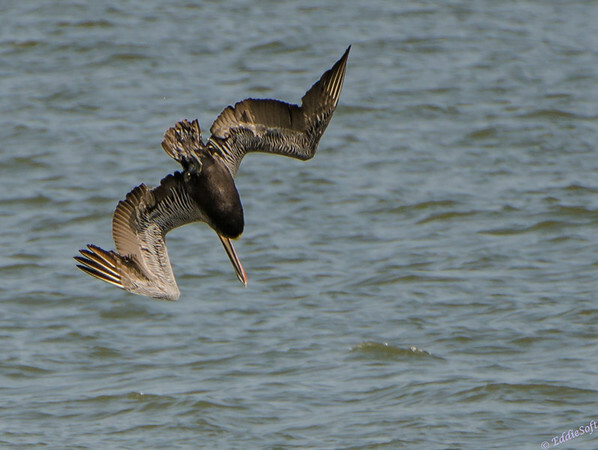 That’s all the shots for the Brown Pelican hunting series. Pretty spectacular if you have not experienced it before. We went back to this same location on our trip there over the recent Holiday break – there was absolutely no Pelicans there this time – bummed, but there was another interesting bird that made it into the tin at the fish cleaning station near there – likely a +1 so it wasn’t a complete waste of time. Believe that wraps up the Pelican series (Brown and White) from the 2013 Texas trip. I’ll leave you with another one of my favorite shots ..
All I need are some toasty waves and intriguing birds. Stay warm everyone, summer is just around the corner. Very nice! And fact-filled! Yes, I read that it stuns the fish, then drains the water from it’s pouch after it scoops up the fish while it sits on the water, then swallows and it’s off again. I’ve seen this behavior and as you say it’s fascinating to watch. It may be a bit soft, but I really like the 90 degree shot the best due to its character. The first one is very artfully done even if it isn’t the theme of the post. Thanks for the Pelican Briefs! I see what you did there.. how clever. I hate it when my loyal readers come up with a title more clever than I did – kudos. Thanks for the more detailed explanation of the fishing process. So, is there holes in the pouch our do they just manipulate their pouch to release the water while retaining the catch? I’ve seen them toss their head in the air to force the food down their neck, but it didn’t even occur to me before that they needed to pour off the water first. Unfortunately, that 90 degree is pretty soft. I’ve made a point to get a better shot the next time we get to witness them fishing. Now that I know what signs to look for I should be able to predict their dive with much better accuracy – I have a lot shots on the cutting room floor of their feet sticking out of the water thanks to a late trigger push.